I love my buddies; they are such an incredibly intelligent band of folks, always coming up with a smorgasbord of thought and opinions to consider. Yesterday, it was the disturbing tendency of Atheists to be obnoxious and just as stick necked as fundie Christians. The similarities, between these two, apparently, polar opposites are pretty basic – fear and pain. Often, upon speaking to “fundie” Atheists, you will find people with scars born of the abuse only clergy can inflict; the abuse of the very essence of an innocent soul. The entire being of an individual is torn to shreds. It might be abuse of a physical nature, sexual or psychological abuse but it is abuse of the foundation of the individual. It destroys faith and for some, this is as bad as the actual abuse, if not, worse. Faith is used as a tool in healing, a powerful tool and when that tool has been annihilated? The abuse is compounded. This then “begets” fear. A horrible, crippling fear that this could happen again, if the guard is let down and other options examined. The fundie Atheist refuses to see the scenery, along the sides of the road, on their one way trip toward Irrefutable Logic Avenue. This has a tendency to create anger beyond reason. The inability to see both sides, whether agreeing or being in total disagreement, the wounds are simply too deep and too wide. This is where the Atheist and the religious join hands. The religious also live in fear. They fear their own choices. They fear personal responsibility. They fear making decisions. They fear their god. Everything about them is based upon fear of any sort of freedom of choice. They refuse, just like the Atheists, to see potential truths that fall outside of their own road – “Pathologic Illogic Boulevard”. The two groups have something else in common – their hatred for the Agnostic. They call them, voices tripping with scorn, “fence-sitters.” The Agnostic, on the other hand, remains firmly seated on their fence, willing to see both sides and asking one simple thing of both: proof. Prove that this bible, Q’ran, Torah/Talmud is based on fact. Prove that prophets are actually the voice of god and not simply faking it at best, suffering from mental illness at the very worst. Prove there is a god, a Jesus, a Mohammed, a Moses; show empirical evidence and the Agnostic will climb off the fence and join you. On the other hand, prove – beyond the shadow of a doubt, that there is no higher power and that nothing happens at the end of the long road of life, except decomposition and the creation of a new dust bunny. Prove there is nothing beyond ourselves. 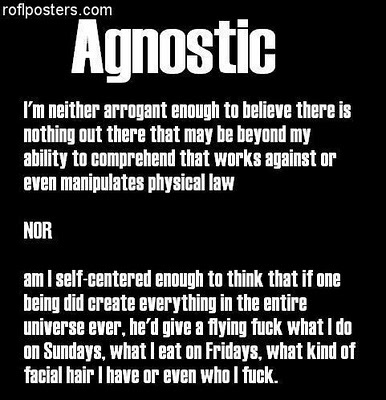 The Agnostic would then, descend from the fence and join the ranks of the Atheists. Neither group is able to prove their points beyond the shadow of doubt nor are they are unable to show proof absolute; this creates fear, fear begets anger and the Agnostic bears the brunt from both sides. Religion or lack thereof is a lose/lose discussion. It is, virtually, impossible to fight fear when it is so, willingly, embraced and accepted, when it is a key stone of an individual’s character.